Back in February of this year, Ed Cole, the Remote Coordinator (we prefer the title "Radio Remote Road Warrior") for Clear Channel Washington DC, contacted us to let us know that he'd be taking his ACCESS for a broadcast overseas. Ed wrote, "I wanted to drop you guys a line to let you know of a special, cool remote broadcast we've got coming up in early March. Our local rock station, DC101, is doing a remote broadcast from the Desert Rock Festival in Dubai, UAE on March 7, and I'm proud to be the engineer for this event. As far as I know, we've never done a remote like this, from a country so far from the United States, and we're pumped for it! ... I've been testing our [ACCESS Portable] locally all week in preparation for this broadcast, and I must say, that little unit rocks! I'll make sure we take pictures and e-mail them to you once we get back home. Would you like me to write up a few paragraphs about our experience once we get back in the States? I'd love to..."
We finally got back home last night after a crazy two days of travel. I'll tell you about that later, but I wanted to thank you guys for hooking me up with that upgrade on my Access! That little unit was a stone cold beast! We got hooked up into their DSL connection. I hooked it into my little Linksys switch, and it connected back here instantly! Like we were back home! It stayed connected the entire broadcast, with only two little hiccups on the IFB return, but they were quick little hits, nothing major. I have pictures and I'd like to write up my paragraph if you guys would like to publish it on your site. Tell me how we get it done? 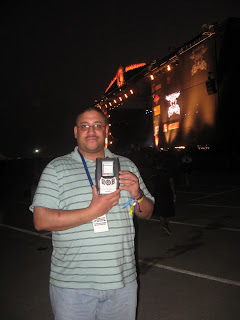 Ed"
"Our local rock station, DC101, had a special opportunity to broadcast from Dubai, UAE, at the Dubai Desert Rock Festival, and my trusty Access unit was with me, ready to work. The trip was interesting from the second we went through security/customs at the airports in DC, Amsterdam, Paris and Dubai. When I took it out of my suitcase each time to run it through security, everyone kept asking me what it is, and I explained it to them, to their amazement. That little baby gets double and triple looks from everyone! 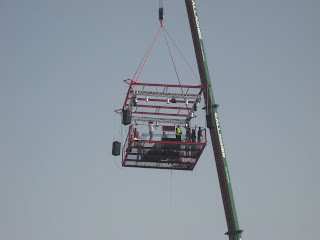 Once we arrived in Dubai, and got on-site where the Festival took place, and got our broadcast setup, the Access worked like a true champ. ... the Access [was] working OT on a DSL connection the local telecom provided for us. To my surprise, it connected back to the rack unit instantly. I thought maybe it would take a few seconds with the distance between us and home base, but it locked in and stayed connected for the entire broadcast. We used the great AAC-LD algorithm, which sounds as good, if not better than ISDN. The delay was minimal, with no loss on either end. I was so impressed by the Access, and it's strength under those extreme circumstances. I can't wait to see what our next worldwide excursion will be, but I know I'll have my partner with me, the Comrex Access! Thank you again guys! I'll keep you updated whenvever we do more cool remotes and the Access tags along with me. Ed"
April 30, 2008 -- NO POTS, NO ISDN! "Great story that went down yesterday...we had an ISDN and POTS line supposedly scheduled to be installed for a remote we did yesterday. Of course, Verizon screwed up, and I couldn't find either line at our location, so I asked the IT guys on-site if we could use either a wireless or hard-wired internet connection to do the show on, and they said yes! 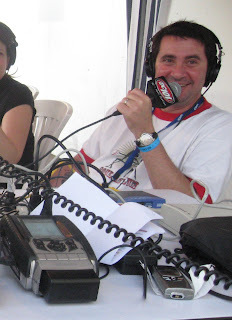 So we fired up on the air yesterday with my handy dandy Access, who bailed us out of a potential disaster! How great is that? :) Ed"
Okay, Ed. You're right. It's really great. Thanks for putting ACCESS through the paces. We're certain that DC101's listeners are lucky to have you working so hard for them.